These windows, from the Prada store at Broadway and Prince Street in SoHo, feature looks from the Fall 2011 collection. I really can’t think about fall right now, especially when it’s 90 degrees outside, but the boldness of the colors here are so striking and inspirational. I especially love the dresses with the structured bodices, dropped waists, and box-pleated skirts. I could imagine myself wearing the blue one. I’d love to see how textile design comes in to play for Miuccia when she’s designing a collection. Two-toned knee socks and neutral bags. 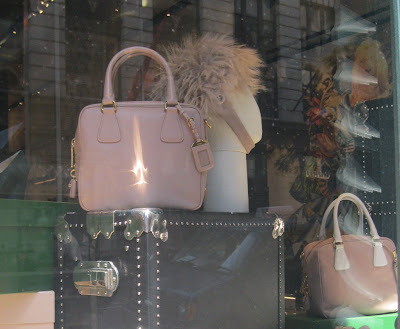 I’d take either bag (I am partial to the two-toned one, lower right), but it’s a pass on the shaggy hat. Shoes you could actually walk in. Yes, please, to the blue! Another, yes please to the blue...love it! I have always loved fall and winter clothes more than summer...I enjoy looking at the Fall Collections! Thanks for sharing the windows. I like the blue too - on someone else though. I look silly in lots of patterns, plaids, and stripes. Those handbags are stunning....drooling over here. I will have the pink one, then, hehehehhe. I'll take a blue one too! Thanks for sharing this! 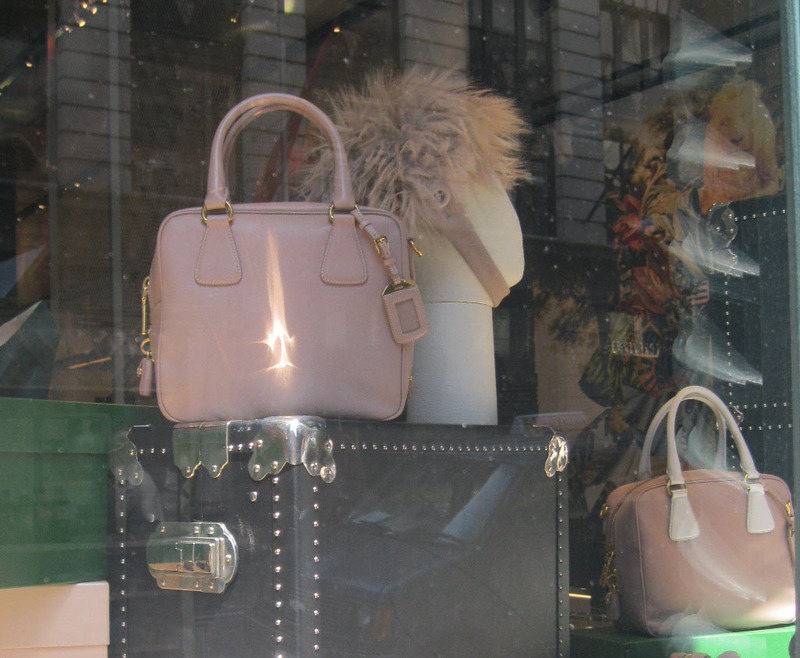 It is always a treat to see what the New York windows are featuring! Hi Pam, I'm with you, I like Fall/Winter clothes better. Summer stuff is nice but it always feels too hot for anything other than the simplest of looks. Hi Adrienne, I would have to put that dress on to know for sure whether I would look ridiculous in it. I normally stay away from bold prints but I am so drawn to this one, I'd at least give it a try! And don't get me started on Prada handbags. Much cheaper than Chanel, made better than Louis Vuitton, and I truly believe would last you forever. I love the Saffiano leather tote, which these are variations of. They offer them in a variety of gorgeous colors. Hi Sacramento, you're right, the pink is gorgeous too. I didn't look at it closely enough because I was too busy being bowled over by the blue. Hi Sarah! I loved the photos you posted of the Madame Gres exhibit. I am always inspired when you put up picture of Parisian shop windows so I hope you will treat us all to those again sometime soon! Hi Catherine, oh the bags are just gorgeous. 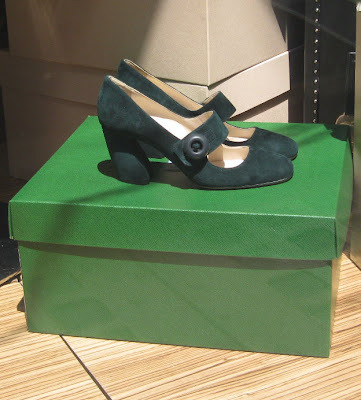 I have thought about forgetting all this Hermes business and just save up for one of these beauties. I want a light colored bag right now! Hi Paula, I was surprised to learn later that they were fall clothes. 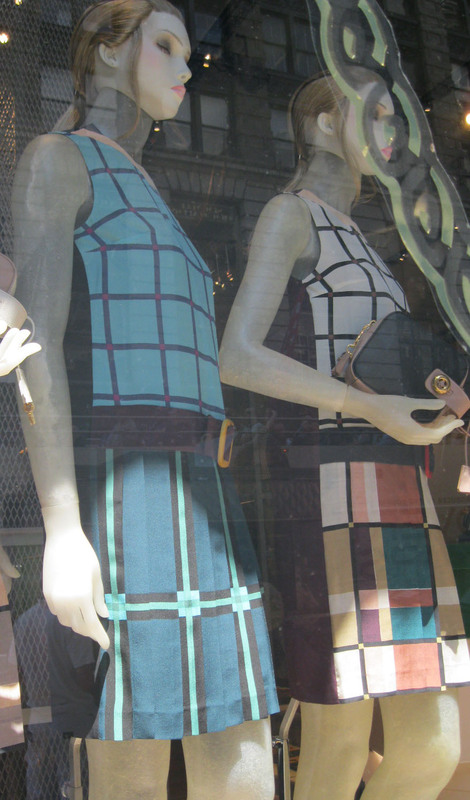 The windowpane dress made me think of fall but those giant plaid dresses really seemed wearable right now. I haven't put on a dropped waist dress in years. I don't know if it'd look so great on me but I'd certainly give any one of these dresses a try!